Wilting under the continuing heat wave, Delhiites are also facing prolonged power cuts adding to their summer woes. In many areas of the Capital, the residents have had to face power cuts lasting several hours caused by frequent breakdowns because of the increase in demand. A senior officer in the Estate Office of Haryana Urban Development Authority (HUDA), Gurgaon 'in collusion with a private party' has been accused of illegally grabbing an institutional plot worth more than Rs 15 crore. A Delhi court has set a lead in clearing the huge backlog of cases by disposing of 51 cases in a day simply by giving an opportunity to the accused to confess their guilt under plea bargaining. After the agitation by the Gujjars on the issue of reservation, it is the Brahmin community which appears quite unsatisfied with the treatment being meted out to them at various levels, including employment. 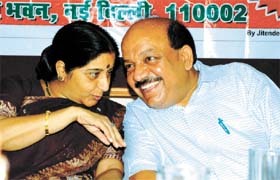 BJP senior leader Sushma Swaraj with the party’s Delhi unit president Harsh Vardhan at a seminar on sacrilegious paintings organised by the Delhi BJP at Hindi Bhavan in the Capital on Sunday. The Delhi Metro is not only safe, comfortable and fast, but the air quality inside the Metro trains is better than in other modes of public transport, including cars, and the outside environment. Haryana Finance and Labour Minister Birender Singh has reiterated there is no question of going back on the implementation of the revised minimum wages of Rs 3510 for industrial workers and labour. A man who was allotted a plot by Haryana Urban Development Authority after expiry of the stipulated three years with a penalty of Rs 66,407 for delayed payments has got relief from the national consumer commission, which has ordered that the entire amount should be refunded to him. The Economic Offences Wing of the Delhi Police today claimed to have arrested a desperate cheat, Syed Nusrat Ali, for allegedly forging the signature of a newspaper editor to provide benefit to a constable of the Delhi Police. With the arrest of Sadakin (27), the North-East district police today claimed to have worked out a blind murder case committed in Seelampur area about one and half month ago. Sahir, the young school boy who at the age of 15 had created a virtual tempest in the art world by his explicitly sensitive photographs of the aftermath of the 2002 Gujarat carnage and later that of the ordeals of the victims of the tsunami in various parts of South India, is back with more of his visual social activism. 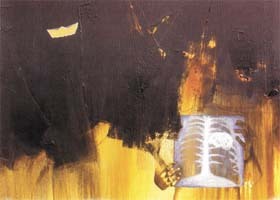 A painting by Somnath Adhikary. In the third such incident in the last four days, an undertrial at the high security Tihar Jail here died allegedly while undergoing treatment for de-addiction. Harish Kumar (31), a drug addict, died last evening at about 7 pm at the Deen Dayal Hospital where he had been admitted for de-addiction in the morning. There is no restriction on courts to frame additional charges against an accused even though the investigating agency might have booked that person under certain other charges, the Delhi High Court has ruled. The BSES claimed the increase in the use of air-conditioners and coolers has led to an unprecedented rise in the demand for power. The peak demand in Delhi has already touched a record high of over 3901 MW and in the coming days if there is no respite from the heat wave conditions it is likely to surpass the 4200 MW mark. A BSES spokesperson claimed it had taken all required initiatives to ensure minimum inconvenience to the consumers. Under its summer action plan, the BSES has geared up its machinery to ensure stable and regular electricity supply to its consumers subject to the availability of power from the Northern Grid. The operations and maintenance department has been geared up to face every eventuality and its machinery, including hydraulic tower wagons, breakdown restoration vans, mobile generating sets, emergency power restoration vans and fault locating vans have been put on call 24X7. The spokesperson, however, said there was some problem with the availability of power because of incidents of overdrawal from the grid by some of the neighbouring states. This had resulted in some dip in frequency levels, tripping and some times shutdown of generating stations. The spokesperson also appealed to the consumers to use electricity judiciously, adopting the habit of switching off and not to use air-conditioners and other high energy consuming gadgets during evening peak hours. "The estate officer, V S Hooda has not reported the complete facts of the case and mislead even the chief administrator, HUDA, Panchkula with ulterior motive and malafide intention," claimed a senior official in his fact finding report. According to the papers available with The Tribune, HUDA allotted an institutional plot no. 45 in Sector 32 measuring 2,035 square metre to M/s Inertia Industries Limited at a total cost of Rs 46.8 lakh in June 28, 1995. Sunil Kumar Tandon was the managing director of the company at that time. However, the company suffered financial losses, as its brewery unit located at Dharuhera, Rewari was closed down in September 1996 following the promulgation of prohibition policy in the state. The company, as per its letter dated 17 May, 2000, requested HUDA to transfer the plot within its group companies to M/s Icon Investment Limited. Since no policy regarding transfer of institutional plot had been framed by the HUDA, no action was taken on the company's request. Due to severe financial crunch, the company gradually became a sick industrial unit and even filed a reference with Board for Industrial and Financial Reconstruction (BIFR) in 2003. Then, the famous liquor UB Group bought all assets of the company and made it functional again in the name of Millennium Beer Industries Limited (MBIL). On October 20, 2005, the MBIL, formerly Inertia Industries Limited, wrote a letter to HUDA to surrender (cancel) the plot and refund the amount deposited so far with HUDA. In total, the company (Inertia) had deposited Rs 17,12,639 with HUDA for the said plot. However, while giving a reference of his earlier letter dated 17 May, 2000, Sunil Kumar Tandon allegedly wrote a letter on November 13, 2006 after a gap of six years to HUDA requesting to transfer the plot in the name of Icon Investment Limited whereas he has no legal locus standi on the said plot. In collusion with Tandon, the Estate Officer (EO) did not cancel the plot as demanded by the new owner (MBIL) and rather on the other hand, sent a letter, dated November 14, 2006, to the Chief Administrator, HUDA, Punchkula mentioning "both the companies were promoted by same promoters and its family and also majority share holding of both the companies are same. So, necessary approval in the matter may be accorded." The EO did not mention the fact that new original owner of the plot had requested to surrender the plot in his letter of 20 October, 2005. However, on January 17, 2007, the MBIL again requested HUDA to cancel the plot and refund the amount. HUDA allegedly gave no reply to the company. On May 23, 2007, the chief administrator, HUDA, acting on the EO's letter on November 14, 2006, gave an approval for the change of nomenclature/constitution from M/s Inertia Industries Limited to M/s Icon Investment Limited regarding the same plot. Sources claimed, "It smells that some officers at HO were hand in glove with EO and Mr Tandon. The market price of this plot is presently more than Rs 15 crore." Contrary to the direction/orders, the EO allegedly sent all correspondence related to this file directly to the CA, HUDA surpassing administrator, HUDA, Gurgaon zone. Additional chief metropolitan magistrate Kamini Lau decided all the cases on Friday, mostly pertaining to violations of the Passport Act, after the prosecution and defence reached a mutual understanding with the consent of the accused under the concept of plea bargaining. Plea bargaining, according to the Criminal Law (amendment) Act, 2005, is an agreement in a criminal case whereby the prosecutor and accused arrange to settle the case with the latter pleading guilty in exchange for concessions, including reduction of prison terms. Earlier, the court examined all the accused in camera and only after being satisfied that they had filed their applications voluntarily, asked the public prosecutor to arrive at a mutually satisfactory way out. It then accepted their pleas and imposed on each accused a penalty of Rs 5,000 for flouting provisions of the Passport Act. Among the 51 accused were three government officials who were released on probation for good conduct. After the agitation by the Gujjars on the issue of reservation, it is the Brahmin community which appears quite unsatisfied with the treatment being meted out to them at various levels, including employment. An all-party meeting of Brahmin leaders and representatives has been called at Ballabgarh on June 23 to discuss such matters and demand better opportunities. This meeting has been called by former MLA Yogesh Sharma. In a statement here today, Sharma claimed the youth of the community had been feeling acutely depressed and frustrated due to the ongoing policy of caste-based reservation. Opportunities for development for a high-caste person were getting narrower due to wrong policies and the social environment that had become caste-centric. He said Brahmins and other castes not covered by any reservation were becoming backward and it was perhaps these communities which were now lagging behind on various counts, which included social, economic and political platforms. He said the meeting would discuss various issues, including the use and misuse of the community by various political parties, including the Congress and the BJP. He said the other communities had already launched an agitation to get their rights in various states. Brahmins would also have to get united and demand proper avenues of development in various spheres. Describing the return of Mayawati-led BSP government in power in Uttar Pradesh, he said this was possible because of the extensive support of the Brahmin community to that party. In Haryana, he said, various political parties had used the votes of this community but had ignored their larger interests after coming into power. Demanding overall change in the present reservation policy, he said reservation, if required, should be given on economic basis instead of caste system. There were socially and economically backward persons in all castes and communities. He said the present system of reservation had become outdated as it served the interests of the 'creamy layer' only and not the poor and deprived people living in villages. The interests of other castes were also hit hard due to denial of opportunities, though this was the fundamental right of every citizen. He said the government could not ignore this reality for long and would have to go for a rational change ultimately as nobody wanted a repeat of recent violence by a community demanding reservation. The DMRC, quoting a Central Road Research Institute (CRRI) study, says that levels of particulate matter inside the Metro are lower than other modes of public transport, indicating that the Metro is a cleaner and healthier mode of transportation. Total suspended particulates (TSP) inside the Metro was found to be about 280 micrograms per cubic metre of air (ug/m3), while this figure was 350 ug/m3 in cars, more than 400 ug/m3 in buses and about 290 ug/m3 for pedestrians. As for particulate matter PM10, Metro cars had a concentration of only about 190 ug/m3 while this figure stood at above 250 ug/m3 for buses and cars. The figure for pedestrians was above 200 ug/m3. According to a commuter survey, carried out as part of the study, passengers preferred the Metro on account of journey comfort, time saving and safety. It found that about 80 per cent of passengers had shifted from the public bus system, nearly 4 per cent from auto-rickshaws and taxis and about 16 per cent from private modes. More than 42 per cent of passengers have own vehicles, which shows that nearly 40 per cent of vehicle owners have already shifted to the Metro. The shift of passengers from road-based transport modes to the Metro is also bringing about substantial savings by indirectly reducing the cost of road maintenance and traffic management. Road maintenance includes routine pavement maintenance such as patching work, micro surfacing, drain clearance and periodical maintenance. like resealing and overlay. Traffic management includes street lighting, signal, law enforcement, accidents, plant watering and parking. The study found that the reduction in vehicle km, due to people's shift to Metro resulted in saving of road and traffic maintenance cost of Rs 159 crore till 2006. Haryana Finance and Labour Minister Birender Singh has reiterated there is no question of going back on the implementation of the revised minimum wages of Rs 3510 for industrial workers and labour. Speaking informally to mediapersons after condoling the death of an industrialist here, he said the government was firm on the decision taken earlier and it would not be withdrawn under any condition. Various industrial associations had been opposing this hike, stating that it was too steep and unjustified. Certain entrepreneurs had also met the Labour Minister on this issue in the recent past and sought a change in the revision. The new wages gives a hike of about Rs 1000 per month as the previous minimum wage was about Rs 2400. While the majority of the labour and trade unions have welcomed the revision, the Joint Trade Union Council has demanded Rs 7000 as minimum wages to the industry workers, as it has claimed that Rs 3510 is still lower in comparison to the general price index and the inflation rate at present. About 10 lakh employees and workers were likely to benefit from this revision, claimed a government official. A man who was allotted a plot by Haryana Urban Development Authority (HUDA) after expiry of the stipulated three years with a penalty of Rs 66,407 for delayed payments has got relief from the national consumer commission, which has ordered that the entire amount should be refunded to him. 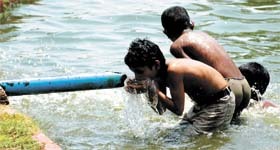 "Considering the fact that there was delay in delivering the possession...It would be just and proper to direct the land development agency to refund the interest charged by it from the allottee on delayed payment of installments," the apex Consumer Commission bench comprising justices M B shah and Rajyalakshmi Rao said. The bench asked HUDA to pay the amount, levied as interest on delayed payment of monthly instalments, to B S Verma within a month. The order came on HUDA'S revision petition filed against the order of the Haryana State Consumer Commission, which upheld a lower court's verdict on the issue and concluded that there was deficiency in service. A recommendation letter purported to have been written by Rahul Sharma, Editor, Hindustan Times, was received in the office of the Commissioner of the Police. With the covering letter, a set of documents related to the out-of-turn allotment of a government accommodation in favour of constable Sunil Kumar Meena were enclosed. When the recommendation letter was sent for verification, it was found to be fake. Apart from the letterhead used, the signature of the editor was also found to be forged. When the constable was interrogated, the name of middleman Ali was surfaced. At his instance, he was later apprehended along with the constable. During interrogation, it was allegedly revealed that Ali had been indulging in such fraudulent practices for a long time. He had earned lakhs of rupees by managing such forged recommendations. The recommendations managed by him had not been cross-checked so he would escape. This time, his luck ran out and he was caught in the police net, said a police officer. Earlier, Ali used to work for some local weekly papers where he sensed the importance of an editor of a reputed newspaper and decided to use it as a tool for his fraudulent practices, the officer added. A tea shop owner, Mohd Talib (18), had been found dead with a gunshot injury. The case was blind as there was neither any clue nor any eyewitness of the case. During investigation, it was revealed that one Sadakin had been very close to the deceased. On interrogation, he confessed his crime. He allegedly said that day he along with his friend Shane Alam had gone to the deceased's tea shop to have tea. Shane Alam was openly flashing his newly bought revolver which he resisted on the ground that it would adversely affect his business. A heated exchange followed and in a fit of rage Shane Alam shot him dead. Shane Alam was already in jail in connection with another case, said a police officer. Sahir, the young school boy who at the age of 15 had created a virtual tempest in the art world by his explicitly sensitive photographs of the aftermath of the 2002 Gujarat carnage and later that of the ordeals of the victims of the tsunami in various parts of South India, is back with more of his visual social activism. He is holding an exhibition of some of his select works entitled "Reflections" at the Academy of Fine Arts and Literature here from June 7 to 11. A final year student at the prestigious St Stephens' College here, Sahir has travelled extensively throughout the country and abroad capturing some of the soul-shattering events on the lens. His photographs have been published by a number of publications and magazines here and abroad. Canvas Art Gallery here is holding an exhibition of the recent paintings of artist Santosh Andani, "185 Days on Canvas," from June 9 to 23. Santsoh, who has been living in the National Capital Territory of Delhi for about a year now, has struggled with loneliness in the bustling metropolis in his endeavour to succeed and this aspect is reflected in his works. The exhibition is being curated by Victor Vijay Kumar. Vadhera Art Gallery here is holding "Numb", a solo show of paintings, drawings and installations by well-known artist Sunil Padwal from June 2 to 30. Padwal's creations have been critically acclaimed both by the critics as well as the peers and many claim his work forces the viewer to think and ponder over what he sees. The Hungarian Information and Culture Centre here along with the Italian Embassy Cultural Institute and the European Union and the Indira Gandhi National Centre For the Arts (IGNCA) is jointly presenting an exhibition of paintings of two Hungarian artists, Elizabeth Sass Brunner and Elizabeth Brunner, at the IGNCA gallery from June 12 to 23. Entitled, "Dreams In Italy - Two Hungarian Artists on Their Way to India", the exhibition consists of 74 works of the Brunners created in Italy representing a very important phase in their lives. Most of the paintings in the exhibition are being put up for public viewing for the first time. The exhibition highlights the art of the Brunners covering their stay in Italy both geographically as well as physically. In the third such incident in the last four days, an undertrial at the high security Tihar Jail here died allegedly while undergoing treatment for de-addiction. Harish Kumar (31), a drug addict, died last evening at about 7 pm at the Deen Dayal Hospital where he had been admitted for de-addiction in the morning, said Tihar spokesman Sunil Gupta. Kumar, who was lodged in prison number seven of Tihar Central jail, was taken into preventive custody last Friday under Sections 107 and 151 of the CrPC from Bharat Nagar area of North-West Delhi, Gupta added. Earlier, two others lodged in the same jail died in the last four days. While Amit (23) taken into preventive custody by Narela police died 'due to dehydration and abdomen pain' on June 6, last Friday (June 8), 57-year-old Kamaljeet, facing corruption charges, died at the hospital after he complained 'of nausea and stomach-ache'. There is no restriction on courts to frame additional charges against an accused even though the investigating agency might have booked that person under certain other charges, the Delhi High Court has ruled. Dismissing a revision petition filed by a man challenging the trial court order framing charges against him for showing cruel behaviour towards his wife for dowry, forcing her to commit suicide, justice S Ravinder Bhat has directed the trial court to frame the additional charge of abetment against him under the Section 306of IPC besides those under Sections 498(a) (cruelty) and 304(b) (dowry death). He said though the state has not filed a challan under Section 306 (abetment) of IPC, the law does not restrict the powers of the court to frame more charges.